1. Combine the water, sugar and salt in a 2-cup measuring cup, and sprinkle the yeast on top. Allow to sit for 5 minutes or until the mixture begins to foam. 2. Weigh the flour into the bowl of a stand mixer. 3. Pour the melted butter onto the flour (I’d zapped the butter in the microwave for about a minute to thoroughly & quickly melt it). 4. Pour the yeast mixture onto the flour. 5. Using the dough hook attachment, mix on low speed (Speed #1 on my KitchenAid mixer) until well combined (about a couple of minutes). 6. Change to medium speed (Speed #2 on my KitchenAid mixer) and knead until the dough is smooth and pulls away from the side of the bowl, approximately 5 to 6 minutes. 7. Remove the dough from the bowl, clean the bowl and then oil it well with vegetable oil spray (Pam spray for me). 8. Return the dough to the bowl, cover with a tea towel and sit in a warm place for approximately 50 to 55 minutes or until the dough has doubled in size. 9. Preheat the oven to 450°F (230°C). Line 2 sheet pans with baking parchment paper and lightly spray with vegetable oil. 10. Bring the 7 1/4 cups of water and the baking soda to a rolling boil in an 8-quart saucepan or roasting pan (I’d used my 12-inch stir-fry pan). 11. 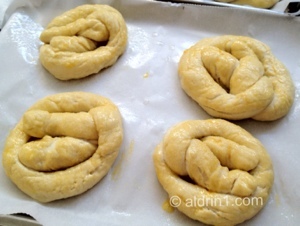 Turn the dough out onto a slightly oiled work surface and divide into 8 equal pieces using a dough cutter (or a chef’s knife if you don’t have a dough cutter) or into 16 equal pieces if making the smaller pretzels. Roll out each piece of dough into a 24-inch (60cm) rope for large pretzels or about 18-inch (45cm) rope for the smaller pretzel. Make a U-shape with the rope, holding the ends of the rope, cross them over each other and press onto the bottom of the U in order to form the shape of a pretzel. Place onto the parchment-lined half sheet pan. 12. Place the pretzels into the boiling water, 1 by 1, for 30 seconds. Remove them from the water using a large flat spatula or strainer. Return to the half sheet pan (leaving about 1/2 to 1 inch space between pretzels), brush the top of each pretzel with the beaten egg yolk and water mixture, and sprinkle with the pretzel salt. 13. Bake until dark golden brown in color, approximately 12 to 14 minutes for large pretzels (10 to 12 minutes for the smaller pretzels), turning the pans around halfway through the baking time. Update: The original recipe makes nice smaller (palm-sized) pretzels that are great as a snack. 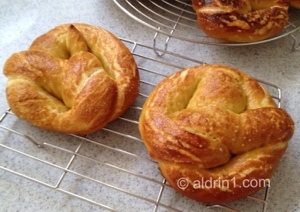 So I’d added additional instructions for how to make the smaller pretzels in the recipe above. Yes I have missed you. The pretzils look great. Thanks! 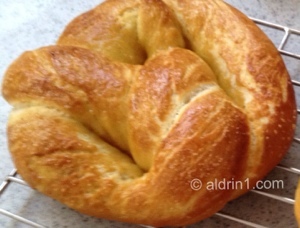 I’d just updated the recipe on how to make smaller, palm-sized pretzels great for snacking.